1 Targeted killing (TK) is the selective execution of terror activists by states. It is about striking terrorists on their way to attack (i.e., "ticking bombs"), and sometimes also the decapitation of terror organizations’ political or military leaders, who account for the ideological or political guidance of terror, or plan terrorist attacks and send others to carry them out. TK has various functions, ranging from prevention, preemption, and deterrence to punishment, revenge, and retribution.1 It is carried out in various ways: firing missiles from attack helicopter gunships, gunning down activists in the streets, blowing up activists’ cars, using long-range sniper bullets, and other, sometimes highly sophisticated means. 2 Whereas in the past — for example, during the Reformation — assassinations organized by governments used to be the strategy or the tactic of the weak, the desperate, or the resourceless, and those who adopted it often tried to conceal it,2 nowadays it is also used by the strong. The moral, legal, and pragmatic problems entailed in TK notwithstanding, this counter-terror method has also been used by Western democracies, such as the US and Israel in the framework of their struggle against terror challenges.3 Both in the US and Israel TKs are no longer concealed. 3 When TK is carried out by a liberal democracy, legal and moral questions come under careful scrutiny by both the domestic and international communities. Is TK compatible with the principles of just cause, discrimination, proportionality, or respecting civil liberties such as the right to life and a fair trial? It is no wonder therefore that most of TK literature focuses on the moral and legal dilemmas it raises.4 The realistic aspects of TK, particularly its effectiveness, are quite neglected. Clausewtiz considered the removal of enemy leadership an important center of gravity that could bring about the enemy’s defeat at a relatively low cost, although he believed that three other centers of gravity, i.e. the destruction of the enemy’s army, the seizure of his capital, or the delivery of an effective military blow against his principal ally, were of greater importance or effectiveness.5 In analyzing TK effectiveness, the debate between airpower strategists John Warden and Robert Pape is very helpful.6 Although it did not develop in a TK-specific context, it provides relevant insights into the issue, as will be presented, below. 6 This article explores whether or not Israel’s use of TK during the intifada was an effective counter-terror method. The main arguments put forth are first, unlike the elimination of military leaders, which proved to be ineffective, the decapitation of Hamas’s political and spiritual leaders seemed to have accounted for the organization’s decision to suspend hostilities against Israel, which essentially meant the end of the second intifada. Second, no direct causal relationship can be proven between TK and the decline in successful anti-Israel Palestinian terror. Other major developments may have affected that decline no less than TK — particularly Operation Defensive Shield in mid-2002, when Israel regained control over the West Bank, and the construction of the security fence in the West Bank since late 2003. 7 The article will first, present Israel’s TK policy. It then discusses TK’s effectiveness in principle. Finally, it tests the effectiveness against the Israeli experience during the second intifada. 9 Israeli TK policy could be considered a classical manifestation of post-heroic policy. The IDF (Israeli Defence Force) has been applying such policy since the late 1970s, both in Lebanon and in the territories, long before the concept was formulated by Edward Luttwak in reference to the post-Cold War US.13 Post-heroic policy has two main rules. The first rule, which Luttwak focuses on, is avoiding casualties to your own troops. The second rule is avoiding the killing of enemy civilians. The roots of post-heroic policy are demographic, social, and moral, and it is characteristic of Western democracies conducting non-existential wars in which their readiness to sacrifice is relatively low. During the second intifada former General Security Service (GSS) head Avi Dichter stressed Israeli ability "to liquidate who cannot be eliminated any other way […] without a serious risk to our personnel,"14 and Prime Minister Ariel Sharon pointed to the need to avoid harm to the Palestinian civilian population that is not involved in terror.15 Whereas for the Israeli side post-heroic warfare served as a bridge between morality and operational effectiveness, the Palestinians preferred heroic warfare, in which many would be killed on both sides. 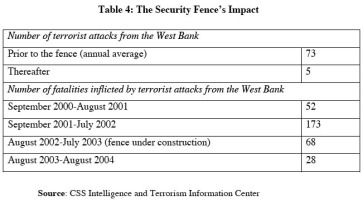 11 From a preemptive method of coping with "ticking bombs" during the early stages of the second intifada, Israeli TK policy became one that also aimed at "ticking infrastructure." It became a preventive rather than preemptive measure, and was applied on a routine, some would say, wholesale basis.21 In an interview with Fox News in 2001 Prime Minister Sharon said he would stick to TKs, which he referred to as "pinpoint preventive actions against terrorists. "22 According to former Chief of Military Intelligence Amos Malka, TKs were carried out by opportunity rather than necessity, and were sometimes motivated by emotion rather than cold reason.23 The GSS had the final word regarding the targets to be executed, with the senior military and political echelon approving its recommendation almost automatically, to the point of almost giving up any discretion regarding the chosen targets and timing of the strikes.24 In November 2006, it was reported that the Israeli security cabinet had decided that unlike the targeting of activists directly and immediately involved in terror, the execution of senior terror activists would be subject to a "hearing," albeit in absentia, with the attorney general.25 This was another indication of the broadening of the TK policy. 13 Reservations regarding Israeli TK policy on moral or practical ground have been expressed not only by scholars but also by Israeli practitioners (e.g., former Chief of Military Intelligence Amos Malka), Israeli politicians (e.g., former ministers of justice Yossi Beilin and Dan Meridor), human rights organizations and activists in Israel and abroad (e.g., B’Tselem28 and Amnesty International29), European politicians and media,30 and Arab politicians and scholars.31 Main arguments against TKs have been that Israel was killing people without trial; that innocent lives might be taken during TKs; that TK is likely to provoke more killings of civilians as revenge and makes it more difficult to forge peace. 14 The danger of intelligence sources exposure, collateral damage inflicted, international and domestic criticism evoked, and greater incentive and motivation of terrorists to retaliate created by the TKs notwithstanding, Israeli TK policy has been consistently supported by Israeli decision makers and the public, despite the widespread understanding that violent means alone could not achieve decisive results.32 The unprecedented murderous nature of Palestinian suicide bombings strengthened the Israeli public’s threat perception and lent legitimacy to the unprecedented scope of TK of terror operatives and leaders. 15 The notion that TKs might have a utilitarian value has been rejected by moralists and international law scholars based on the assumption that they may boomerang, i.e., intensify rather than pacify the conflict. This section focuses on the dilemma regarding the targets chosen for elimination. Whose elimination is more effective – the elimination of low-rank military operatives, military leaders, or political leaders, if at all? 16 In a debate that took place in the 1990s between two schools of airpower strategists, different views were presented regarding the effectiveness of decapitation as a war-winning strategy. Although it focused on high-intensity conflict (HIC) rather than low-intensity conflict (LIC) situations in general and counter-terrorism in particular, and on physical destruction rather than morale, it nevertheless reflects a basic dilemma between political and military centers of gravity. 17 According to John Warden, the most effective way of incapacitating the enemy and causing its defeat is to target its decision makers. Warden presents a comprehensive, five-ring model that is reflective of a system of centers of gravity, ranging from the nation’s leadership (the innermost target), key production, infrastructure, and a population’s support for its government to fielded military forces (the outermost ring), in that order of priority and importance. He considers decapitation of leadership the most effective way of imposing one’s will on the enemy, although he recommends simultaneous strikes on each ring’s center of gravity.33 Robert Pape, on the other hand, is skeptical about the chances of eliminating enemy leadership,34 as "individual leaders are hard to kill, governments are harder to overthrow, and even if the target government can be overthrown, the coercer can rarely guarantee that its replacement will be more forthcoming. "35 He warns that in cases where leadership strikes or strategic bombings fail, the consequences could lash back and even be catastrophic, as happened after NATO’s air strikes near Belgrade in March 1999, which were followed by the killing and ethnic cleansing of thousands of Albanians.36 Instead Pape recommends conventional combat against fielded forces at the operational level. He doubts airpower’s effectiveness in terror and guerrilla situations for two main reasons: first, it is difficult to discriminate between guerrillas or terrorists and the population.37 Second, although decapitation of suicide terrorists can disrupt their organization’s operations temporarily, it rarely yields long-term gains.38 TK usually aims not only at a terror organization’s leadership, in accordance with Warden’s preference, but also at terror operatives who could be considered military targets. Pape’s theory does seem to apply to terror or guerrilla situations, where large fielded forces are not employed, although he may be right regarding the long-term outcomes. 18 Asaf and Noam Zussman’s approach integrates Warden’s and Pape’s ideas. On the one hand, they recommend the targeting of senior leaders with specialized knowledge and skills, based on their belief that it will have the strongest effect on the terrorists’ capabilities. At the same time, however, they distinguish between military and political leaders, preferring the targeting of the former. Underlying their preference is the claim that the targeting of political and spiritual leaders will not significantly decrease the capability of the terrorist organization, and will only increase the motivation to carry out terrorist attacks. Targeting low-rank terrorists, in their view, is not likely to disrupt seriously the operation of the organization, whereas the targeting of senior military leaders will generate little increase in the motivation of the organization to carry out attacks and will evoke less rage and fewer calls for retaliation than the killing of political leaders. It also has the potential to severely disrupt the organization’s operations, as military leaders are involved in planning operations and recruiting, training, arming, and dispatching terrorists.39 As much as this thesis seems logical, the Israeli case does not support it, as will be shown below. 19 Due to the elusiveness of terrorists, the process of spotting a new target, assigning a weapon to hit it, and finally hitting it, must be as short as possible. Advanced command and control systems, as well as improved intelligence, surveillance, and reconnaissance (ISR) capabilities could shorten this process considerably – from days to minutes.40 Not only does this require technological capability; it also makes it necessary to implement a high degree of inter-service jointness, which means that bureaucratic and organizational affiliations and loyalties must be overcome. WAS TK EFFECTIVE DURING THE SECOND INTIFADA? 21 According to former IDF Chief-of-Staff Dan Halutz, TK policy proved to be extremely effective in curbing terror activity against Israel.42 In this section I will first present some TK statistics, and then examine the difference between the effectiveness of eliminating military as opposed to political operatives. 22 In the period September 2000-April 2004, Israel carried out 159 TK attempts, dozens of attempts each year, with the highest rate – 56 attempts (35 percent) – in 2002, after 40 attempts (25 percent) in 2001 and 44 attempts (28 percent) in 2003. The decline can be explained by the fact that in mid-2002 the IDF regained control of the West Bank and could afford to arrest rather than kill in this area. Most of the strikes — 69 percent — took place in the West Bank. 23 TK methods included shooting from close range or by snipers (47 percent), launching missiles from helicopter gunships (34 percent), explosive devices, such as booby-trapped vehicles (14 percent), and other methods (5 percent). 24 Since in some cases members of more than one organization were targeted simultaneously, division by organizational affiliation is difficult. It is estimated, though that some 50 percent belonged to Hamas, some 31 percent to Fatah, 17 percent to Islamic Jihad, and the rest to other organizations. 25 Eighty-five percent of the attempts ended up with the targets killed; the rest were injured or saved. These high rates of success were achieved thanks to high-quality intelligence, based on a combination of SIGINT, HUMINT, and a variety of vision devices, such as unmanned aerial vehicles (UAVs), which led the Israelis to their targets. Additionally, increased joint inter-service (ground forces-military intelligence-air force-police-GSS) activity allowed the IDF to overcome the problem of targeting an elusive enemy,44 after overcoming bureaucratic and organizational affiliations and loyalties. 34 As for as the killing of political leaders, it is true that the killing of Abu-Ali Mustafa, Secretary-General of the PFLP, in August 2001 accounted for the killing of Israeli Minister of Tourism Rehavam Zeevi as revenge two months later. However, the PFLP was a small organization, and as such Mustafa could not be considered a significant center of gravity as far as the Palestinian struggle against Israel as a whole was concerned. The elimination of Islamic Jihad leader, Fathi Shikaki, in Malta in October 1995 did paralyze the organization for a few years,62 although it had only a limited effect on Palestinian anti-Israel terror activities because of the relatively small size and limited significance of Islamic Jihad at the time. 36 Hamas’ leadership feared TK so greatly that when in September 2005 Israeli Defense Minister Shaul Mofaz warned two of its leaders, Mahmoud al-Zahar and Isma’il Haniyya, that should they or any of the other Hamas leaders continue firing Qassam rockets to Israeli territory, "we will send them to place where Rantisi and Yassin are,"64 Hamas announced its decision to stop firing the rockets. These findings seem to support John Warden’s view on the effectiveness of the decapitation of political leadership. 42 Targeting military leaders and operatives proved to be ineffective. It failed in affecting the stability and morale of the terrorist organizations, in increasing tensions and personal competition among heirs, in thwarting planned terror attacks, and in forcing the organizations to waste time and energy in protecting leaders and finding hiding places for operatives. It rather elevated specific individuals to martyrdom, strengthening their morale and resolve. New terrorists replaced eliminated ones, proving that it was difficult to effectively destroy a highly motivated, decentralized, and compartmentalized organization. TK of military leaders and operatives also provoked murderous retaliations, with unprecedented numbers of Israeli civilians being killed, which only stimulated further escalation and riots. 43 The decapitation of Hamas’s political and spiritual leaders, on the other hand, seemed to be rather effective. The correlation between TK of Palestinian political and spiritual leaders and the end of the second intifada speaks for itself. The decapitation of Hamas’s political or ideological leadership in mid-2004 seems to have played a major role in the organization’s readiness to suspend hostilities against Israel, which essentially meant the end of the second intifada. Hamas never elected a new leader to replace Yassin and Rantisi. It decided to participate in the municipal and parliamentary elections in the territories, and moderated its anti-Israel rhetoric. For example, it expressed readiness to respect previous international agreements signed by the PA, accept Israel as a fait accompli, and agree to a long-term hudna with the Jewish state. If rumors that Israel had poisoned Arafat are founded, then this, too, proved to be effective, as his successor, Abu Masen, declared that the violent intifada was over. Avi Kober is a senior lecturer in the Department of Political Studies at Bar-Ilan University and senior research associate at the university’s Begin-Sadat Center for Strategic Studies. 1 Steven R. David, Fatal Choices: Israel’s Policy of Targeted Killing (Ramat Gan: BESA Center for Strategic Studies, 2002), pp. 16-21. 2 David C. Rapoport, Assassination and Terrorism (Toronto: Canadian Broadcasting Corporation, 1971), pp. 33-43. 5 Carl von Clausewitz, On War (Princeton, NJ: Princeton University Press, 1976), pp. 486, 596. 6 John A. Warden, "The Enemy as a System," The Airpower Journal 9, no. 1 (Spring 1995), pp. 44-54; John A. Warden, "Success in Modern War: A Response to Robert Pape’s Bombing to Win," Security Studies 7, no. 2 (Winter 1997/98), pp. 172-90; Robert A. Pape, Bombing To Win: Air Power and Coercion in War (Ithaca, NY: Cornell University Press, 1996); Robert A. Pape, "The Limits of Precision-Guided Air Power," Security Studies 7, no. 2 (Winter 1997/98), pp. 93-114; Robert A. Pape, "The Air Power Strikes Back: A Reply to Barry Watts and John Warden," Ibid., pp. 191-214; Robert A. Pape, "The True Worth of Air Power," Foreign Affairs 83, no. 2 (March/April 2004), pp. 116-30. 7 David, Fatal Choices; Asaf Zussman and Noam Zussman, Targeted Killings: Evaluating the Effectiveness of a Counterterrorism Policy (Jerusalem: Bank of Israel, Discussion Paper Series, January 2005), at http://www.bankisrael.gov.il/deptdata/mehkar/papers/dp0502e.pdf; Gal Luft, "The Logic of Israel’s Targeted Killing," The Middle East Quarterly X, no. 1 (Winter 2003), at http://www.meforum.org/article/515; Eisenstadt, "Pre-Emptive Targeted Killings As a Counter-Terror Tool: An Assessment of Israel’s Approach;" Chris Toensing and Ian Urbina, "Israel, the US and ‘Targeted Killings’," Middle East Report Online, 17 February 2003, at http://www.merip.org/mero/mero021703.html; http://www.ict.org.il/counter_ter/Is_ct.htm; Mordechai Kremnitzer, Are All Actions Acceptable in the Face of Terror? On Israel’s Policy of Preventive (Tatgeted) Killing in Judea, Samaria and Gaza (Jerusalem: Israel Democracy Institute, 2005) [Hebrew]; Michael L. Gross, "Fighting by Other Means in the Mideast: A Critical Analysis of Israel’s Assassination Policy," Political Studies 51, no. 2 (June 2003), pp. 350-68; Emanuel Gross, "Self-defense against Terrorism: What Does It Mean? The Israeli Perspective," Journal of Military Ethics 1, no. 2 (2002), pp. 91-108; Stein "Israel’s Assassination Policy: Extra-Judicial Executions." 8 Boaz Ganor, The Counter-Terrorism Puzzle: A Guide for Decision Makers (Herzliya: International Policy Institute for Counter-Terrorism, 2003) [Hebrew]; Shlomo Gazit, "Israel," in Yonah Alexander, ed., Combating Terrorism: Strategies of Ten Countries (Ann Arbor, MI: University of Michigan Press, 2002); Shmuel Gordon, Israel against Terror: A National Assessment (Tel Aviv: Meltzer, 2002) [Hebrew]. 9 Daniel Byman, "Do Targeted Killings Work?" Foreign Affairs 85, no. 2 (March/April 2006), pp. 95-111. 10 Byman, "Do Targeted Killings Work?" p. 98; Zussman and Zussman, Targeted Killings. 11 Alex Fishman, "Extinguishing the Fire and Gaining Time," Yediot Aharonot Weekend Supplement, 21 January 2005. 12 Byman, "Do Targeted Killings Work?" p. 102. 13 Edward N. Luttwak, "Where Are the Great Powers?" Foreign Affairs 73, no. 4 (July/August 1994), pp. 23-28; "Toward Post-Heroic Warfare," Foreign Affairs 74, no. 3 (May/June 1995), pp. 109-122; Edward N. Luttwak, "A Post-Heroic Military Policy," Foreign Affairs 75, no. 4 (July/August, 1996), pp. 33-44. 14 Broadcast on IsraCast.com, 10 June 2005. 16 Yael Stein, "Israel’s Assassination Policy: Extra-judicial Executions," B’Tselem Position Paper, at http://www.btselem.org/Download/200101_Extrajudicial_Killings_Eng.rtf. 21 Raviv Drucker and Ofer Shelah, Boomerang (Jerusalem: Keter, 2005) [Hebrew], p. 162; Amos Harel and Avi Isacharoff, The Seventh War (Tel Aviv: Yediot Aharonot, 2004) [Hebrew], p. 198. 22 Adel Darwish, "Descent from Hell," The Middle East, 1 September, 2001. 23 Harel and Isacharoff, The Seventh War, p. 194. 24 Drucker and Shelah, Boomerang, p. 162. 25 Zvi Bar’el, "Assassination, but only after a Hearing," Haaretz, 26 November, 1996. 27 National Strategy for Combating Terrorism (Washington, DC: US Government Printing Office, February 2003). 28 Stein, "Israel’s Assassination Policy: Extra-judicial Executions." 29 Amnesty International, "Israel and the Occupied Territories: Israel must end its policy of assassinations," at http://web.amnesty.org/library/Index/ENGMDE150562003?open&of=ENG-ISR. 30 Darwish, "Descent from Hell,"; Herb Keinon, "Danish FM: Zeevi Murder Same as Targeted Killings," Jerusalem Post, 19 October, 2001, at http://www.ynet.co.il/articles/1,7340,L-2892734,00.html#n. 32 Tamar Hermann, "Tactical Hawks, Strategic Doves: The Positions of the Jewish Public in Israel on the Israeli-Palestinian Conflict (Summer 2002)," Strategic Assessment 5, no. 2 (August 2002). 33 Warden, "The Enemy as a System," pp. 44-54. 34 Pape, "The True Worth of Air Power." 35 Pape, Bombing To Win, p. 316. 36 Pape, "The True Worth of Air Power." 37 Pape, Bombing to Win, p. 31. 39 Zussman and Zussman, Targeted Killings. 40 19 minutes in Afghanistan, see Fred Kaplan, "High-Tech US Arsenal Proves Its Worth," The Boston Globe, 9 December 2001; 38 minutes in Iraq, see Gen. Richard B. Myers, "The New American Way of War," Remarks before the Navy League’s Sea Air Space Exposition, Washington, DC, 16 April, 2003, at http://www.dtic.mil/jcs/chairman/new_american_way_of_war_16apr03.htm. 41 Seymour H. Hersh, "King’s Ransom: How vulnerable are the Saudi Royals?" The New Yorker, 22 October, 2001, at http://www.newyorker.com/fact/content/?011022fa_FACT1. 42 A briefing before the Knesset Foreign Affairs and Defense Committee in 8 November 2005, Haaretz, 9 November 2005. 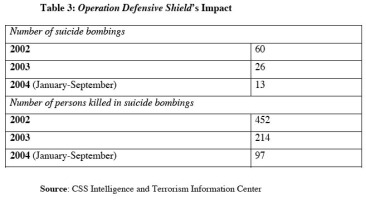 43 The statistics are based on Zussman and Zussman, Targeted Killings. 44 Interview with IAF Chief General Shkedy, Janes Defence Weekly 42, no. 1 (5 January 2005), p. 34. 47 Luft, "The Logic of Israel’s Targeted Killing." 48 Zussman and Zussman, Targeted Killings. 49 Drucker and Shelah, Boomerang, p. 159. 51 Zussman and Zussman, Targeted Killings. 52 Harel and Isacharoff, The Seventh War, pp. 193-94. 54 David, Fatal Choices, p. 21. 57 Scharf, "In the Cross Hairs of a Scary Idea." 59 Byman, "Do Trgeted Killings Work?" p. 103. 60 Edward N. Kaplan, "Tactical Prevention of Suicide Bombings in Israel," quoted in Guiora, "Targeted Killing as Active Self-Defense," p. 24. 61 For example, the strike against Rantisi was criticized by President Bush as contributing to the cycle of Israeli-Palestinian violence. The administration also criticized Israel when an F-16 plane fired a laser-guided bomb into a building in Gaza City, killing Hamas military leader Salah Shehadeh and 14 other people, including eight children. 62 David, "Fatal Choices," p. 4. 63 Harel and Isacharoff, The Seventh War, p. 210-11. 64 Steve Weizman, "Conflict Returns to the Gaza Strip," The Associated Press, 30 September, 2005. 65 Yediot Aharonot, 24 February, 2006. 67 Byman, "Do Targeted Killings Work?" p. 103. 70 Ibid. ; David A. Jaeger and M. Daniele Paserman, The Cycle of Violence? An Empirical Analysis of Fatalities in the Palestinian-Israeli Conflict, at ftp://repec.iza.org/RePEc/Discussionpaper/dp1808.pdf, p. 32.